The Shadow a Student Challenge Begins! We are inspired by efforts to close the gap between, how we prepare our young people in school today AND what the world expects of them tomorrow. At Construct, we use the tools of design to inspire curious, creative, and confident change-makers in education. Since 2014, we have been working with students, teachers, school leaders, community, and industry partners to catalyze an eco-system ready to re-imagine and re-design student-centered learning experiences. Our mission is to ensure all young people have the skills they need to thrive today and tomorrow. Make sure students are at the center of the conversation abut school improvement! Take the challenge, spend a day walking in the shoes of an Oregon public school student. The Shadow a Student Challenge happens across the country each year. Organized by the School Retool team, part of the K12 Lab at Stanford's d.school, this national event begins tomorrow, February 25. All of the Oregon School Retool Fellows will participate. We thought it would be fun to spread even wider and across educational stakeholders! Will you take the Challenge this year? The Shadow a Student Challenge is a journey that starts with seeing school through a student's eyes, identifying meaningful opportunities to improve the experience for your students, and taking action to create change at your school, for your students and community. Beginning on February 25th, educators from around the world will spend a day immersing themselves into the lives of students to deeply understand what school is like for young people today. This is not an observation. This is not a fly-on-the-wall experience. This is an opportunity to really get a sense of what school is like through eyes of a students by becoming a student again. Your student is going to PE class? Get your gym clothes on. Taking a test in math class? You’re taking it too! You’ll walk away from the day with a newfound understanding of your school, and your students. By taking this Challenge, you are committing to experiencing your Shadow Day as a student. You will receive tools and materials to support you in selecting the student you want to shadow, setting a learning goal for your Shadow Day, and tips from previous Shadowers on how to really immerse yourself into the student experience – it's harder than you think to step out of our teacher shoes! Shadowing can lead to deeper insight into your school; you'll likely surface some challenges and obstacles facing your school and students, and you will also have a new sense of the amazing things your school is already doing. This challenge is designed to help you figure out what's important, and how to take immediate action to address the insights you'll gather gathered during your experience. You'll receive tools, resources, and ideas for ways you can take action at your school based on your Shadow Day experience. The Shadow is just the beginning! We are thrilled to kick off 2019 focused on what's important – our students. Sign up to join the movement today! Not a Tweeter? Like our new Facebook Page to connect with other Shadowers and share your stories! On February 23rd and March 5th, 2018, Construct is pleased to bring the "Breakaway" service to the Newberg School District. 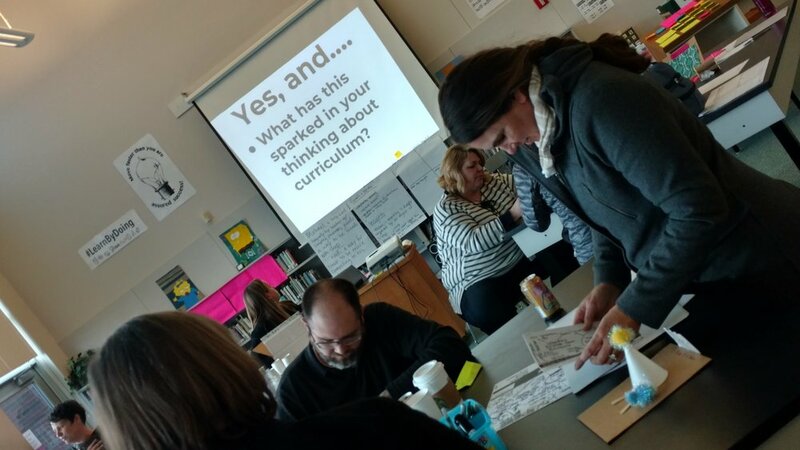 20 teachers and staff from Newberg High School and surrounding middle schools completed the Breakaway workshop -- two days of intensive professional development, learning a design-driven method for curriculum creation that builds a culture of innovation in their schools. 27th. The Make-A-Thon introduced students, educators and community members to coding, engineering, design, and prototype creation. Newberg principals and assistant principals also completed a School Retool training in 2017.
best for Newberg students,” said Karen Pugsley, principal at Chehalem Valley Middle School. student-led design challenges during the 2017-2018 school year. This will complete the second phase of Innovate Newberg. content area classes to undertake real-world design and build challenges. These challenges often benefit the entire community. Oregon’s initiatives in the testbed of Innovate Yamhill County. build resilience in their local community. To find out how to bring Innovate to your community, contact us. On January 25, 2018, 20 Central Oregon public school administrators--selected as the next set of School Retool Fellows--will learn techniques to “hack” new ideas and solutions for their schools. The middle- and high school principals and vice principals, represented in this second Oregon cohort of the School Retool program hail from four unique school districts across the region: Culver, Redmond, Crook County, and Bend/LaPine. Designed in partnership by Stanford University’s d. School K12 Lab and design firm IDEO, and based on research by the Hewlett Foundation, School Retool is a three-month professional development fellowship that helps school leaders to redesign their school cultures to foster innovation in teaching and learning. It addresses challenges principals face modernizing educational models to keep pace with the demands of a rapidly changing world. Principals and school leaders engage in a collaborative series of workshops and “hack” cycles within their schools that create and celebrate opportunities for Deeper Learning -- a set of six research-supported competencies that directly benefit students by putting them at the center of the work. School Retool cohorts are active in Chicago, Colorado, Dallas, Idaho, Michigan, New Hampshire, New Mexico, North Dakota, Oakland, Ohio, Oregon, Puget Sound, Rhode Island, San Diego, San Francisco, Sonoma County, Virginia, Washington, D.C., and Western Pennsylvania. “School Retool is a critical building block in Construct's piece of Innovate Initiatives, a series of integrated programs, building one on the other, that expand the capacity for creativity and innovation in schools. Allowing educators and school leaders to practice new mindsets and behaviors, working across regions and creating supportive new peer groups--these steps are helping Oregon school communities to realize a tangible path toward 21st-century success for all our students." said Gina Condon, founder of Construct Foundation. Construct Foundation, participating school districts, and the HDESD combined resources to bring School Retool to serve these education leaders in Oregon, with Construct subsidizing participation costs. Both HDESD and Innovate Oregon helped ignite interest in potential Central Oregon administrators and schools. Construct is part of a three-year onboarding program offered by Stanford, for local partners who are looking to convene School Retool in their state. Stanford will be engaged throughout this onboarding process, ensuring ongoing training and fidelity measures are being met or exceeded. Construct Foundation and its’ partners—Concordia University, Oregon Community Foundation, and Ken and Marta Thrasher, along with our thought leader, the Oregon Business Council—are pleased to present The Future of Learning. As always, we are grateful for the opportunity to work with College Possible in support of recruiting diverse students. After two weeks working alongside experts, mentors, and with the generous contributions of members of the unique learning eco-system assembled for this challenge, these amazing students dazzled industry and education leaders with smart, thoughtful, and innovative solutions to this complex real-world problem. Click here for details on the 10 day challenge and the final product solutions. Construct is following-up this impressive effort with an intentional, new, next step in the process—a Phase II opportunity where our high-schoolers will be moving one of their creative design solutions for the Future of Learning from prototype to product. Thanks to all our supporters and partners, Construct has had a tremendously busy 2017. Besides the Breaker summer high-school challenge: we launched our first in-school Breaker effort for elementary students; hosted a social justice challenge at Concordia University; facilitated a pilot cohort of School Retool--a change framework program from Stanford’s d.school K-12 lab--for Oregon principals from the mid-valley and metro regions; and we brought Breaker teacher training to Yamhill County. The James F. and Marion L. Miller Foundation, Ford Family Foundation, and Oregon Community Foundation provided invaluable guidance, support, and resources to our work this year. Next year will bring even greater outcomes. We’re hiring a Director of Programs; expanding our partnership with Innovate Oregon with whom we are presenting at an innovation summit for the Confederation of Oregon School Administrators for an anticipated 500 school leaders; our second School Retool effort will launch in Central Oregon; and we’re continuing deeper learning programming work in Newberg, Willamina, and at Centennial High School. Stay tuned for the next chapter of Construct. It’s gonna be a doozy! PORTLAND, ORE. – FEBRUARY 8, 2017 – On Feb. 10, 2017, 18 school principals selected as Oregon’s first School Retool fellows will learn techniques to “hack” new ideas and redesign their school cultures to foster innovation in teaching and learning. Who says teenagers are too young to learn entrepreneurship basics? Here in Portland Oregon, a group of high school students used business modeling to achieve what can only be described as an ugly success. The teens participated in a “Future of Food” design challenge sponsored by Portland education incubator Construct Foundation. Their task: 1) research food-related business ideas, 2) test their findings through interviews with farmers, producers, distributors, and food entrepreneurs, 3) build and verify prototypes, then 4) pitch the resulting business models to an audience of food industry experts, entrepreneurs, and investors. Week 2 was a whirlwind at Breaker, with students creating viable solutions to real-city problems. After only one day of rest, Monday brought the big design “go time.” Out of their percolating ideas, extensive research, interviews from last week, Breakers started moving from brainstorming into blueprinting and prototyping their solutions. How might we plan for and design eco-friendly neighborhoods to maximize the quality of life for Portland residents of varying cultures and income levels? What does KairosPDX Co-Founder have to say about Construct? "Construct Foundation believes in a child-centered approach to education that draws from the leading research about how children learn best. This belief coupled with a strategic three-year investment in KairosPDX has made room for us to develop a transformative model for historically underserved kids that lays the foundation for closing systemic opportunity and achievement gaps. We are thrilled to have Construct's investment of resources and ideas to make sure our model is ahead of the curve. "